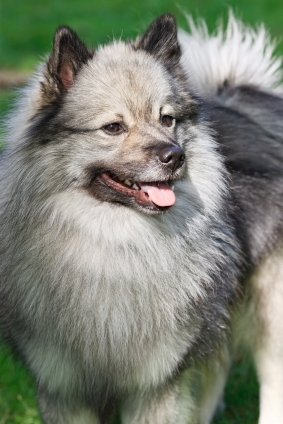 The Keeshond is a medium sized Spitz-type dog, hardy and capable of withstanding winter temperatures. He has apparently limitless stamina and needs opportunities for plenty of exercise and physical challenges. He needs an experienced owner who is also energetic and firm. Like most dog breeds temperaments vary and you will get Keeshonds who are calmer and less energetic. His thick, double coat will need to be groomed carefully and frequently. Some Keeshonds have excessively long coats (an undesirable exaggeration) and this type should be avoided when choosing a pet. 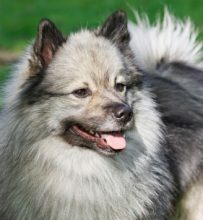 Whilst thriving in cold conditions the Keeshond could suffer in warm weather due to his excessively thick coat. Exercise should be avoided in warm conditions and care taken to provide a cool place to rest. An excessively long coat will make matters worse. Hip dysplasia: breed mean score 10.9 (parents should be lower).